This document discloses Colorado Valley Communications’ (“CVC”) network management practices pertaining to its Internet services, as well as the performance characteristics and commercial terms of those services. A retail customer’s use of CVC’s Internet services is governed by the Internet Access Service Agreement provided upon initiation of service and located at https://www.cvctx.com/internetserviceagreement. CVC is committed to an open Internet. CVC does not engage in any practice that blocks or throttles lawful Internet content, applications, services or non-harmful devices, subject to reasonable network management. In addition, CVC does not engage in practices that prioritize some Internet traffic over other traffic, either to benefit an affiliate or in exchange for consideration. High-speed bandwidth and network resources are not unlimited. This necessitates that CVC manage its network to deliver the best possible Internet experience to all of its customers. CVC adheres to reasonable network management policies that are consistent with industry standard and tries to use tools and technologies that are minimally intrusive. Very few of CVC’s customers are impacted by the protocols and practices CVC uses to manage its network. CVC engineers its local facilities to meet customers’ traffic requirements. CVC uses network management software to conduct periodic monitoring of its network in order to determine the rate of utilization and to detect congestion and abnormal traffic flows. CVC is able to manage congestion, if it occurs, with monitoring techniques that include identifying high volume users by specific thresholds to the minute. In addition, CVC will add capacity to its network before utilization reaches full capacity. Nevertheless, network congestion may cause some customers to temporarily experience longer download or upload times or slower surf speeds on the web. CVC’s network management practices are “application agnostic”. CVC does not: (1) block or rate-control specific protocols or protocol ports, (2) modify protocol fields in ways not prescribed by the protocol standard, or (3) otherwise inhibit or favor certain applications or classes of applications. CVC does not presently employ any restrictions on the types of non-harmful devices that may connect to its network or have any approval procedures for so doing. CVC is committed to securing its network and protecting its customers from network threats and annoyances. The company proactively monitors network activity to help guard against a wide range of security threats including: viruses, botnets, worms, spam, and other harmful activity. We encourage customers to adopt their own security practices. As its normal practice, CVC does not employ security measures that are likely to affect a customer’s ability to access the content, applications, services, and devices of their choice. The company may, however, block or limit such traffic as spam, viruses, malware or denial of service attacks to protect network integrity and the security of its customers. Customers engaging in conduct that abuses or threatens the company’s network, or which violates the company’s Internet Access Service Agreement, will be asked to stop such conduct immediately. A failure to respond or to cease any such conduct could result in service suspension or termination. CVC’s Internet services are “best effort”. This means the level of performance is not guaranteed. Rather, actual speeds and latency will vary depending on the current traffic load. CVC makes every effort to support advertised speeds and will dispatch repair technicians to customer sites to perform speed tests as needed to troubleshoot and resolve performance issues that are caused by CVC’s network. Keep in mind that service performance may be affected by a variety of factors outside of CVC’s control, including: Internet congestion beyond CVC’s network, the particular website being accessed, the condition of inside wiring at the customer’s premise, and the performance and configuration of the customer’s computer, wireless router, and other equipment. CVC offers Internet service over DSL, fixed Wireless and Fiber to the home (FTTH) facilities. 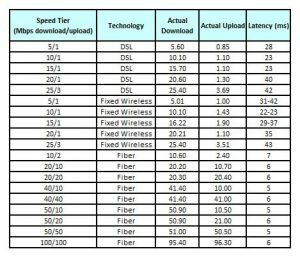 CVC offers speeds ranging from 1.5 Mbps to 100 Mbps. Not all service plans are offered on all technologies. Below is a general description of CVC’s Internet service offerings. 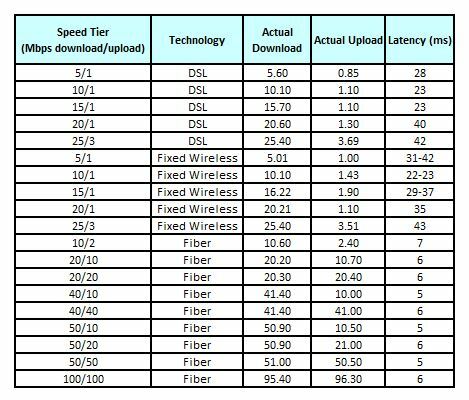 For each offering, the following information is provided: The advertised speed tier (i.e., expected download and upload speeds), the service technology, the actual download and upload speeds (based on internal testing), and latency. All CVC’s Internet service plans above 1.5 Mpbs can support real time applications. CVC does not currently offer any specialized non-broadband Internet access service data services. Accordingly, customers’ Internet experiences will not be impacted. The monthly prices and related fees for CVC’s Internet service offerings are located at: https://www.cvctx.com/pricing. For questions, complaints, or requests for additional information, please contact CVC at 979.242.5911, toll free at 800.242.5911, or via email at info@coloradovalley.com.